Place Vendôme is the latest fragrance from luxury jewelry house Boucheron, and it's their first under new licensing arrangements with InterParfums (they used to be with L'Oreal). It's a woody floriental named for the location of the brand's flagship store in Paris. Place Vendôme Eau de Parfum* opens bright and citrusy, with a slight trail of orange blossom, and the usual pink pepper very much in evidence almost from the start. The heart is soft and velvety, and floral in the modern style. The press materials promise that "jasmine deploys its full floral power", but of course that is nonsense. If you are scared of indoles — or white flowers, or traditional oriental fragrances, or even any vague hint of skank — do rest assured that flowers are kept on the same tight leash here that they are in nearly every mainstream perfume these days. Still, there is orange blossom, and there is jasmine, and reportedly some peony, presumably to keep things fresh and light (other notes: honey, benzoin, cedar and rose). As Place Vendôme dries down, it gets softer still, and the velvety finish eases into full (but not heavy) powder. The honey is light, as is the benzoin, but it is slightly sweet, and there's a nice musky warmth to the finish, which is otherwise woody and pale. In weight, it is medium-to-light; I should not think it would overwhelm in any but the hottest, most humid weather, nor, applied lightly, should it bother your co-workers or cellmates, or whatever. Verdict: On the one hand, it's nicely done, even quite nicely done. It's pretty, easy to wear, and feminine. It smells grown up, and reasonably elegant — it will not embarrass its lovely cut glass bottle (see below) or its wearer. On the other hand, it doesn't smell all that distinctive, in fact, it smells an awful lot like too many other things to bother puzzling out. I would say of it pretty much what Angela said of B de Boucheron back in 2009: "restrained, feminine, bourgeois, and conventional — yet with an eye on current trends", which come to think of it, isn't all that different from what I said about Miss Boucheron back in 2007. Boucheron Place Vendôme was developed by perfumers Olivier Cresp and Nathalie Lorson. It is available in 30, 50 and 100 ml Eau de Parfum (shown above) and in 30, 50 and 100 ml Eau de Toilette (pink juice, with a pink dome on top of a silver cap, not shown). *I have not tried the Eau de Toilette, which appears to be available overseas but not in the US as of yet. It is reportedly quite different than the Eau de Parfum. What a beautiful bottle! Its a shame that perfumes today lack distinctive character. “Pretty” or “elegant” is not a convincing reason to spend $80 plus on a perfume. I don’t know…for many people, I am sure it is plenty! will also say that I don’t know that you’d even know it wasn’t distinctive unless you smelled tons of new perfumes, and after all, how many consumers do that? that is the danger of loving perfume! Exactly, and also the danger of releasing 1000+ new perfumes a year! Really? I agree it will probably sell just fine, but actually I tend to think this might be more readily identifiable even to non-perfume hounds as not especially distinctive. I agree completely that it smells grown-up (despite the pink pepper, no adult woman would need fear she smelled like a teenager)–but when I think of it in contrast to other widely available adult woman scents, Chanel No. 5, Shalimar, etc., this seems pretty generic. I guess it depends on your perspective…I’m not sure that many women care about smelling distinctive vs just smelling pleasant? Hard to say. In my own prior life, I sure didn’t worry about it. But honestly have no idea. If the market is any indicator, women mostly want to smell like they just showered. As I go further into the “perfume woods” I get these thoughts how others I meet perceive my smell(s). No doubt: gen population is very conservative and don’t go beyond malls. As I go further I get attracted by more and more by unconventional (in common perception) smells. Have I started smelling “weird” for other people, office or otherwise? I used to “hate” jasmine, but now I kind of like it, not to the full extent yet though, but still: it’s a development for us, right? Or: I used to think Odalisque is awful, now I longing to have it and compare with the old preform. one. Yesterday, when I wore Like This, I caught myself thinking if I should keep kind of away so not to scare by my smell. Weird, huh? By the sound of it Place Vendome won’t scare anyone for sure. You know, when I’m out in public I wear my fragrance VERY lightly, or not at all. I used to wear fragrance to smell nice, now I wear it for me…so I can smell something I enjoy. So a definite change for me. I liked Miss Boucheron:). And I do have Boucheron B..I don’t really wear it much at all but the bottle is amazingly nice. I will sniff this one…if only to get my hands on that lovely bottle:). Then this might be right up your alley…it really is a lovely bottle. Well, I did just put on some Miss Boucheron..it’s been a while. While this isn’t very distinctive or about wearing a statement…almost Avon-ic…it’s simple and pretty and sometimes I want that every once and a while:D. Gets compliments too when I wear it. Oh, I’d say both Miss Boucheron & Place Vendome are better done than most of what Avon puts out. Place Vendome is more sophisticated, “older”, than Miss Boucheron. Perhaps Avon-ic to those seeking out something really distinctive or niche-y like..is kind of what I meant:D.
A more mature Miss Boucheron? I am interested. I tried Jaipur for men by Boucheron two weeks ago and was pleasantly surprised, really loved it. So much Photoshop magic at work here–maybe Angela can give us an eyewitness account but I think the Place Vendome been a construction site for years now, for the Ritz refurbishment. I think even fume heads (at least lady fume heads) need to have one well made pretty floral. I was just looking at the new Anthropologies and remarking that this would look really staid next to them, but, looking again at these, I have to admit that their opulence would make the anthropologies look cheap. I think this would be nicer with a more graceful lid: this is just slightly TOO clunky. 90% of the fragrances I see in person are ruined by the lid…there is only so much you can do with plastic, I guess. I did see this one in person but can’t remember the lid, which might be a good sign. The body of the bottle reminds me of Dior’s Escale series. I originally bought the small bottle and went back the next day for the large one. This is soft, floral creamy love that has me floating along in a beautiful aura. Place Vendome while not groundbreaking or earth shattering is very lovely and a pleasure to wear. 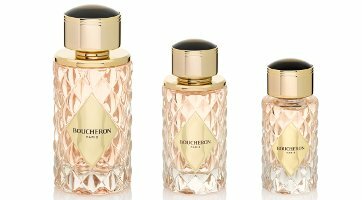 I grew up with my mama wearing Boucheron in late 80’s and 90’s and always remember her beautiful ring of a bottle of pure parfum sitting on her makeup table. Wearing Boucheron makes me a bit nostalgic. btw…The bottle is gorgeous heavy cut glass and the lid is nice. The lid comes off and almost has an opaque clear cabochon on top. You’re right lids can make or break a bottle. Love Ramon Monegal and initially loved the flip top and thought it was kitchy and different but now it’s a pain in the tail to spray your arms. Forget it… lose the flip top and give me a bottle I can spray quickly and race out the door.